Alleppey is the main center for backwater cruises in Kerala, with most houseboats departing from there. If you're planning on going on a cruise, it's a good idea to stay somewhere close to the boat jetty so that you can go early in the morning to inspect the boats and choose a decent one. There are a number of inexpensive homestays in this area of Alleppey. 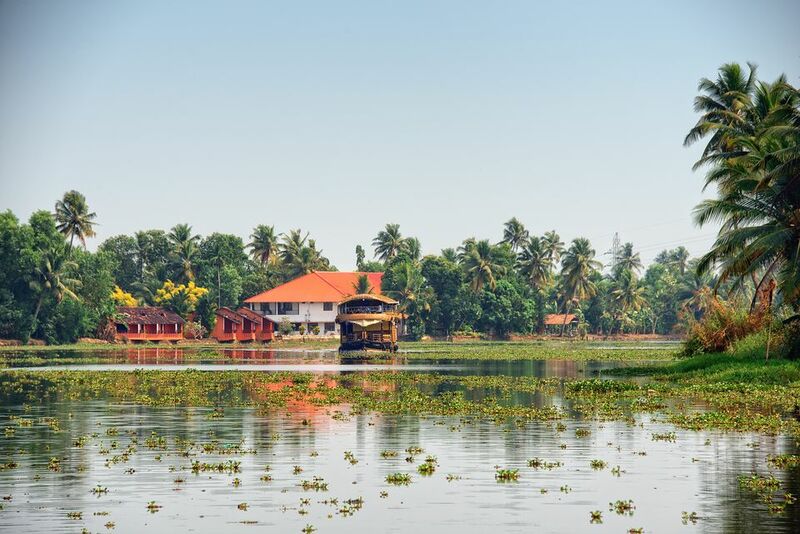 Alternatively, there are some peaceful homestays out of town along the backwaters. Possibly the most popular homestay in Alleppey, Venice Castle is reasonably priced, very centrally located, and modern. There are five simple but spacious guest rooms (four with air-conditioning) in the hosts' newly constructed bungalow. Even though the house is right in town, its landscaped garden and leafy surroundings gives it a very tranquil feel. Guests can socialize on the balcony and common area on the upper floor. A delicious home-cooked Kerala breakfast is served, and the hosts are really lovely. It doesn't get much better than this! Location: Boat Jetty Road, opposite the District Tourism Promotion Council office. It's only few minutes walk from the bus stand and boat jetty. Price: From 1,500 rupees per night, including breakfast. If you're into natural health and wellness, this soulful homestay will definitely appeal to you. The hosts are a friendly European-Indian couple. She's a dance choreographer and meditator, while he's an Alleppey local who works in the tourism industry but studied philosophy. Their home has a rooftop dance studio where yoga, meditation, and holistic dance classes are held every week. Also of note, the property is environmentally-friendly and is the only homestay in the area to run almost entirely on solar energy. There are five guest rooms, all non-smoking. Guests can smoke on balconies, although consumption of alcohol isn't allowed. Location: Near the Nehru Trophy boat race finishing point, close to the boat jetty and about 10 minutes walk from the center of town. Price: From 2,500 rupees per night, including breakfast. Kalappura Homestay is a great budget option in Alleppey, with a number of standout features. Guests can use the property's kitchen to cook their own food, and bring their pets along. Bicycles are available for hire. The very hospitable host is also extremely helpful, welcomes guests with a chilled beer, entertains with interesting conversation, and even invites guests to family weddings! All this, without being intrusive. Location: In a quiet part of Alleppey, about 10 minutes walk to the bus stand and boat jetty. Price: From 1,000 rupees per night with shared bathroom and 1,250 rupees per night with private bathroom. Breakfast is additional. There are five guest rooms (three with air-conditioning) and the entire homestay can be booked for 4,000 rupees per night. Cheap, clean, central, and cheerful sums up Alapatt Homestay. There are four rooms, all with private bathrooms and some with air-conditioning. The two rooms on the top floor have direct access to the communal rooftop terrace, which is the perfect place to relax and watch the wildlife or chat to other guests. This homestay is excellent value! Location: Finishing Point Road, close to the Nehru Trophy boat race finishing point, boat jetty, and bus station. Price: From 800 rupees per night. Breakfast is additional. Housed in a beautifully maintained heritage home bordering a backwater canal, this homestay has 11 guest rooms set around a central courtyard that's open to the sky. They're furnished with antiques left by the spice traders. All have new and spotlessly clean bathrooms, and some have air conditioning. There's also a meditation room, common room with balcony overlooking the canal, spa, and Ayurvedic doctor. The homestay will cook special Ayurvedic food for guests who a prescribed a specific diet. Location: CCNB Road, west of Kochukada Bridge. It's a few minutes drive from Alleppey Beach and about 10 minutes from the boat jetty. One of the oldest lighouses in India is about 5 minutes walk away..
Price: From 1,500 rupees per night. Erathra Homestay is perfect if you want to stay close to town but experience the scenic environment of the backwaters. The property is located in a small village about 15 minutes from Alleppey by ferry (it's also reachable by road but access is poor). There are paddy fields on one side and the river on the other, and you can lazily watch the passing boats from hammocks in the yard. The homestay is an intimate one, with just two guest rooms on the top floor. The knowledgeable host is very well-traveled and has lived aboard. He's an excellent cook and prepares all the meals for guests. Cooking classes are also possible, and small boats are available for rent from the locals to explore narrow canals along the backwaters. Location: Off Chingam Road, near Nurse Jetty. Price: From 3,500 rupees per night, including breakfast. About 15 kilometers (9 miles) south of Alleppey, Ayana's is a very popular homestay on the Pampa River. It's named after the host family's first grand-daughter. The bungalow, while traditional in style, is new and purpose-built with four super comfortable guest rooms. The south Indian food is delicious, and guided village walks and sunset canoe boat rides are all part of the experience. A yoga studio is also being constructed on the terrace and will be an added attraction. Price: From 3,000 rupees per night, including breakfast. Kurialacherry House is a wonderfully secluded hideaway amid nature that's only accessible by boat. It's also located on the Pampa River, not far from Ayana's Homestay. The property consists of an ancestral home with three unique guest rooms, one of which used to be a 100 year old rice granary before being converted. Couples looking for a romantic getaway will find the room with private garden overlooking the lotus pond to be ideal. Candlelight dinners with accompanying music are arranged. Bathrooms with open-air showers are another highlight. Location: Champkulam, about 18 kilometers (11 miles) south of Alleppey. Price: From 4,000 rupees per night, including breakfast. Vembanad House has a lush waterfront location on massive Vembanad Lake in the heart of the Kerala backwaters, about 30 minutes drive north of Alleppey. A boutique homestay with four guest rooms in a beautifully restored ancestral farmhouse that's separate to the hosts' home, it will particularly suit families or groups of friends who want their own personal space. The hosts have a strong interest in sustainable development and responsible tourism, and their homestay has been set up as a way of preserving local culture. Many different activities are possible including cooking classes, visits to nearby markets and temples, night fishing with local fishermen, bird watching, cycling, and canal cruises. Price: From 7,800 rupees per night, including breakfast.